The Science Museum provides a phenomenal backdrop to events looking to engage with their customers. Razer is the world’s leading lifestyle brand for gamers with a fan base that spans every continent, it is one of the most recognised brands in the global gaming and esports communities. 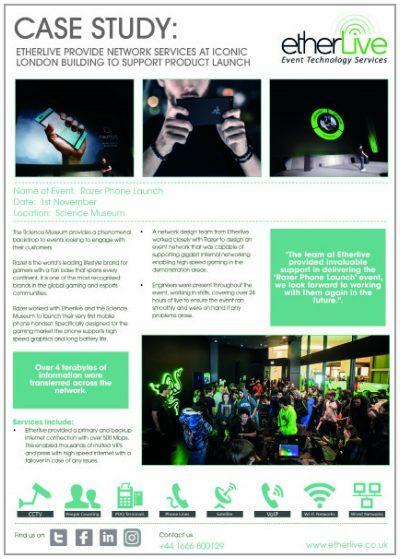 Razer worked with Etherlive and the Science Museum to launch their very first mobile phone handset. Specifically designed for the gaming market the phone supports high-speed graphics and long battery life. Etherlive provided a primary and backup internet connection with over 500 Mbps. This enabled thousands of invited VIPs and press with high-speed internet with a failover in case of any issues. A network design team from Etherlive worked closely with Razer to design an event network that was capable of supporting gigabit internal networking enabling high-speed gaming in the demonstration areas. Engineers were present throughout the event, working in shifts, covering over 24 hours of live to ensure the event ran smoothly and were on hand if any problems arose.